One of two men accused over the murder of a US-born nun in Brazil has said he shot her in self-defence, contradicting earlier statements he made to police. Rayfran Sales said he thought Dorothy Stang was pulling a gun from her bag, when she instead reached for a Bible. Mr Sales and another man went on trial on Friday for allegedly killing the nun on the orders of ranchers with whom she was quarrelling over Amazonian land. Sister Dorothy had fought for peasant farmers' right to own land in the area. The 73-year-old activist's body was found on a dirt track in a remote part of Para state earlier this year. Her death galvanized the Brazilian government to send thousands of troops to the region in an effort to end illegal logging and forest clearance. Brazil's President Luiz Inacio Lula da Silva has promised to bring the nun's killers to justice and to end what he has described as a culture of "impunity" surrounding land disputes in the Amazon. Mr Sales told a court in the northern Brazilian city of Belem that he shot Sister Dorothy because he feared she had a gun in her bag. He told the court she reached into her bag with the words: "The weapon I have is this". Instead of a gun, however, he said she produced a Bible. Mr Sales' co-accused, Clodoaldo Batista, is said to have encouraged him. The court heard that in earlier testimony to the police, both men had spoken of an execution-type killing, in which Sister Dorothy was shot several times at close range as she read from a Bible. Contradicting this in court on Friday, Mr Sales said he had acted impulsively in self-defence. He also said one of three men alleged to have ordered the killing was not involved. The three men, two of them ranchers, are in custody awaiting trial next year on charges of paying and arranging for the killing. 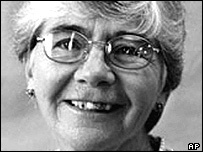 Many landowners in the area have openly argued that Sister Dorothy's murder was in legitimate defence of property. Hundreds of the nun's supporters have travelled to the city of Belem for the trial, being held amid tight security. The campaigning nun was a thorn in the side of the region's most powerful political and economic interests, reports the BBC's Tom Gibb, often denouncing illegal logging and forest clearance and multi-million dollar corruption by local politicians. She pushed for land to be granted to landless peasants as an environmentally-friendly alternative to large-scale ranching and logging. Environmentalists and activists say they operate in fear of their lives in many parts of the Amazon region where landowners' militias still hold sway.